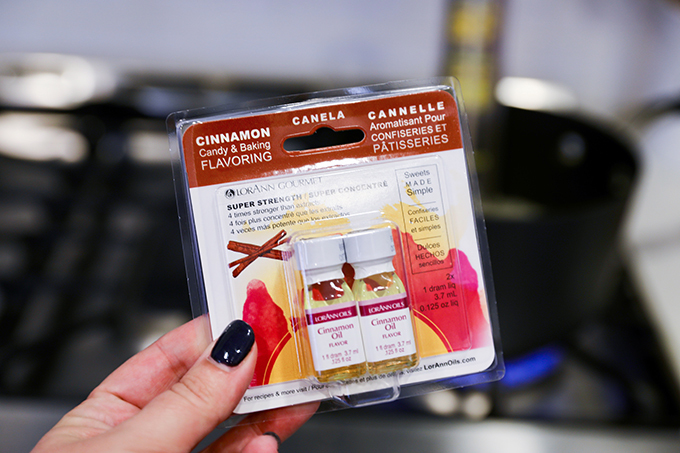 Hard Candy is a surprisingly easy treat to make and this Cinnamon Hard Candy is perfectly sweet and spicy! 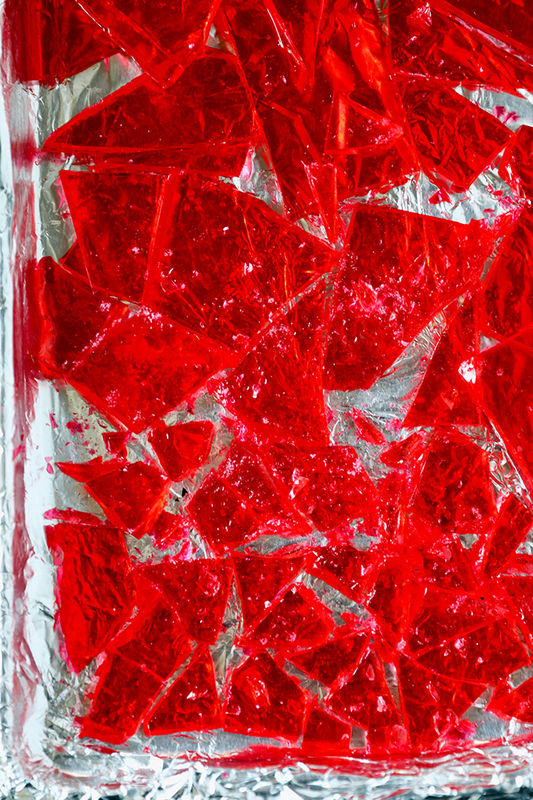 Hard candy is just a simple mix of sugar, light corn syrup and water, boiled until it reaches the hard crack stage. 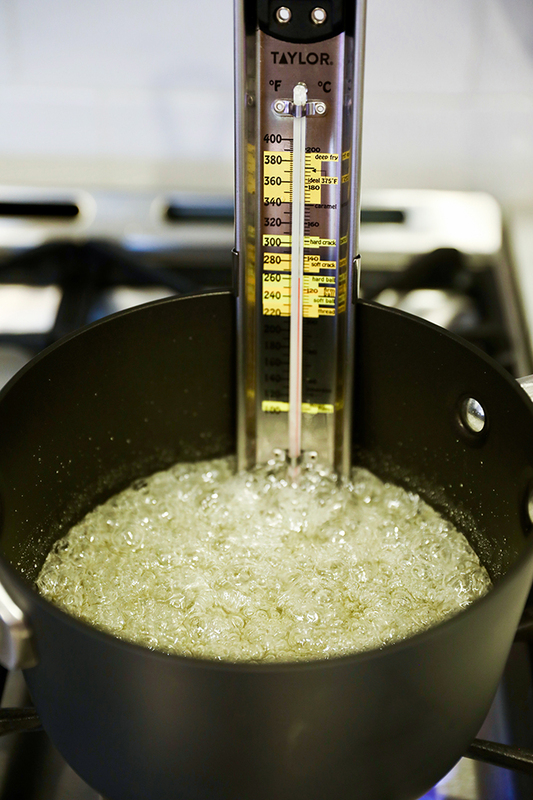 If you have a Candy Thermometer, its a very simple and quick process. You could really add any flavored oil and food coloring. I chose to make Cinnamon candy because, like some of my other candy recipes, it’s what my Grandma Wanda used to make at Christmas time. Making candy sounds intimidating, but really, if you follow the steps and reach the right temperature on the candy thermometer, it’s a snap. The sugar, corn syrup and water mixture needs to come to a boil and reach 300 degrees F.
The secret to this cinnamon candy is the cinnamon oil. I picked this up at Michael’s. It’s much, much stronger than extract and the recipe only calls for a teaspoon, which is one of these little bottles. You can add another 1/2 teaspoon, but that makes it extra spicy and I think it would be too spicy for some, especially children. 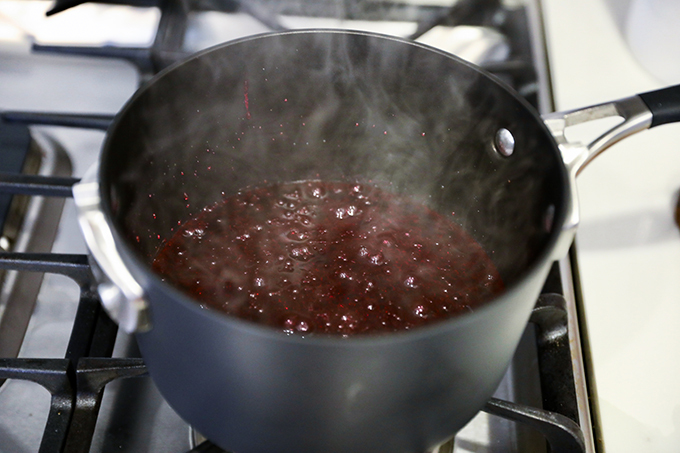 Add the cinnamon oil and the red food coloring to the pan and give a final stir. Keep your face well away from the steam once you have added the oil and handle it carefully. I might even recommend plastic gloves. I accidentally touched my face when I had some of the oil on my finger and it immediately started burning, and when I tried to wash it off, I spread it all over my face instead. I spent half the day with a bright red burning face.🔥 😨 🔥Some people are more sensitive to cinnamon and this oil is extremely concentrated. Take care not to get it on your skin, and don’t touch your eyes when handling it. 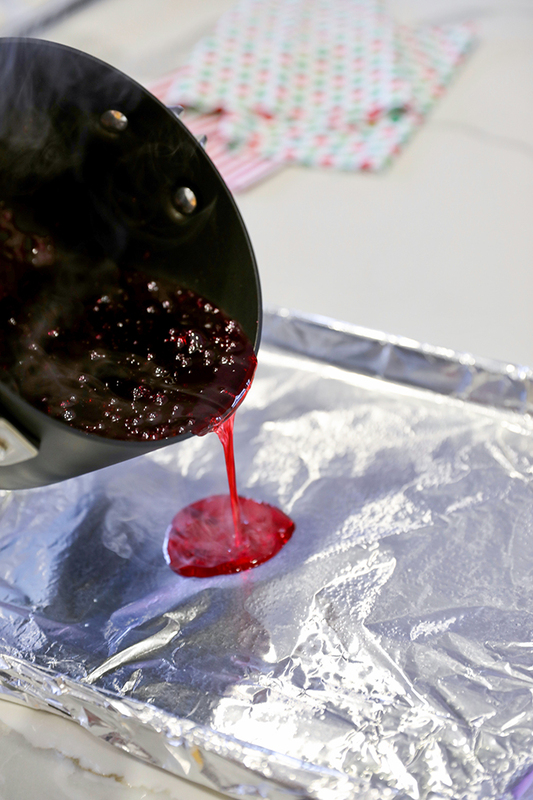 Immediately pour candy mixture onto a heavy duty baking sheet lined with heavy duty foil that has been sprayed with non stick cooking spray. 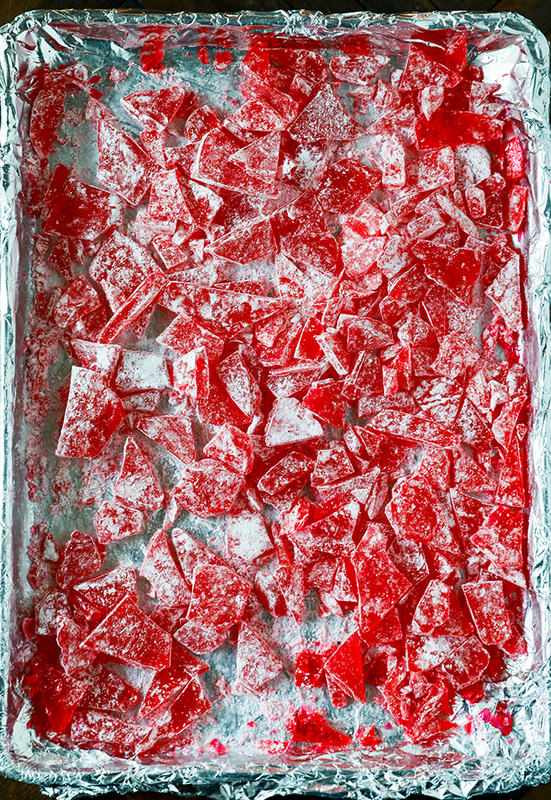 Let the hard candy cool completely. This will take about 45 minutes to an hour depending on the heat of your kitchen. Break into small pieces using a kitchen mallet or heavy measuring cup. Sprinkle with powdered sugar and stir. In a 3.5 quart sauce pan fitted with a candy thermometer, heat sugar, corn syrup and water together over medium heat, stirring occasionally until sugar is dissolved, about 5 minutes. 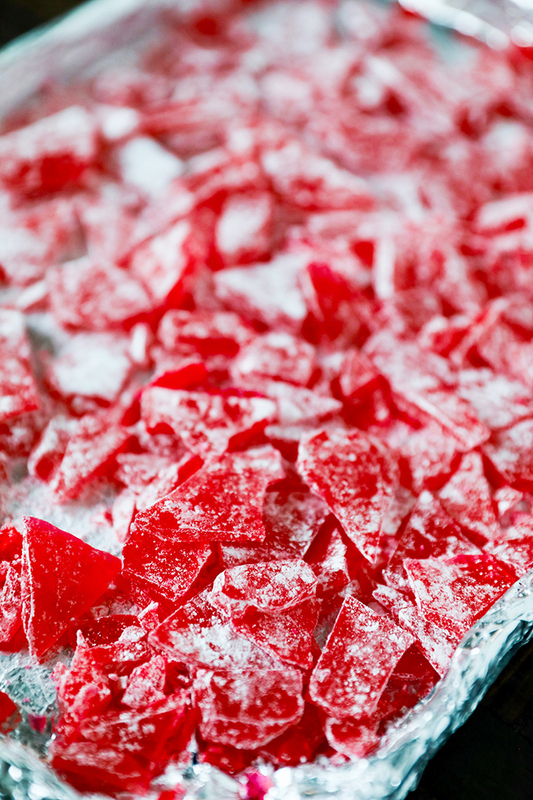 While sugar mixture is heating, prepare a baking sheet by lining it with heavy-duty foil and spraying with non stick cooking spray. 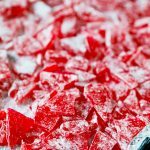 Increase heat to high and let candy mixture come to a boil until it reaches 300 degrees F (hard crack stage) on a candy thermometer. Remove from heat and stir in food coloring and cinnamon oil. Keep face away from steam and handle cinnamon oil carefully, it can irritate skin with direct contact. 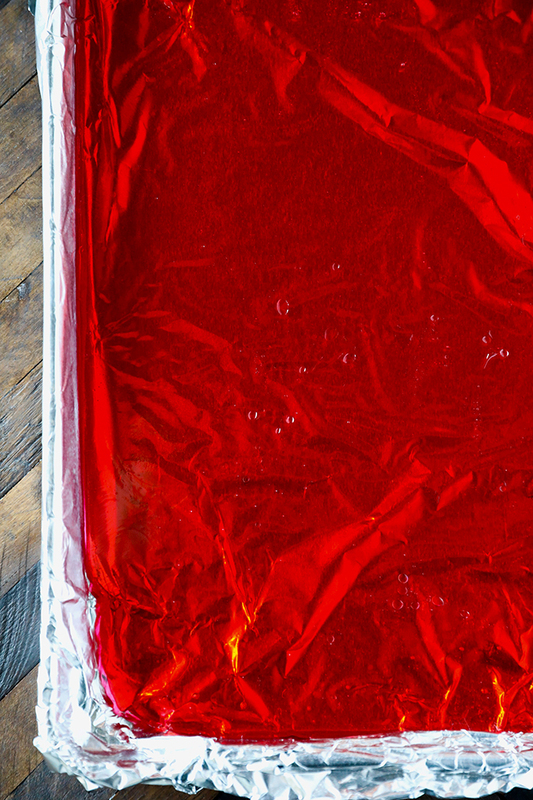 Immediately pour candy mixture onto foil lined baking sheet and let cool completely. Once cooled, use kitchen mallet or heavy bottomed measuring cup to break up pieces. Sprinkle with powdered sugar.